Capt. Darrin Isaacs of the SPELLBOUND, a 41-foot Hatteras, had his hands full with this one. The marlin ate a jet lure and gave them a lot of trouble at leader. 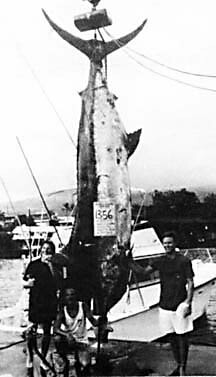 So much so that they clipped a 130-lb outfit to the 80-lb rig the marlin was hooked on so they could turn the big fish's head. Fight time was four hours.